We absolutely love swimming as a family. Both my girls have swimming lessons and when Little Man turns four he will also start learning to swim. Water safety is a huge priority and whilst Little Man might not yet be able to swim he understands the basics of holding on and not running in the swimming pool. 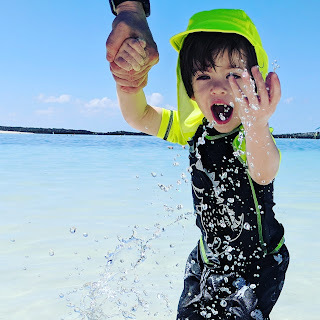 No matter how many times you teach your child not to run at the pool they do occasionally forget as the excitement of wanting to play in the water takes over, and unavoidable slips happen which can lead to nasty falls. There are over 230,000 recorded accidents every year in European swimming pools. Which makes you wonder why more isn't done to help prevent these accidents from happening. 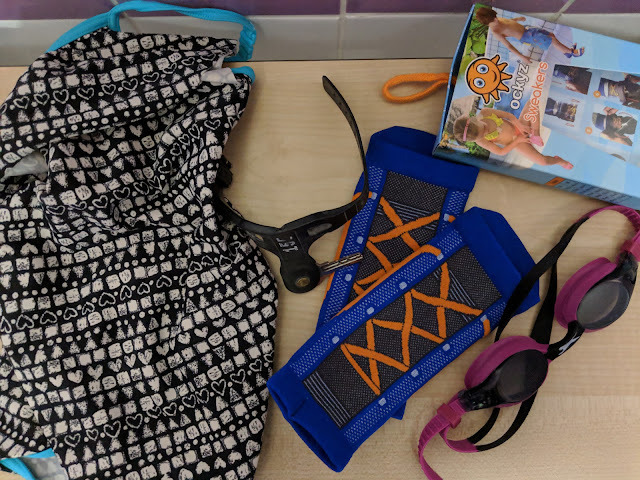 Swimming pool sides are wet which makes them slippy and it isn't always possible to wear shoes or flip flops to help give extra grip when walking on the edges and prevent slipping. When it is practical to do this it is often the case that you cannot swim in this footwear, this is where Ockyz Sweakers are useful. Ockyz Sweakers are non slip swim socks. They have been tested positively by TUV Rheinland, an authority in testing safety products in Europe and also tested positively by the Dutch Consumers Union. Sweakers are made from a thin stretch fabric which provides a 'second skin' feel and are comfortable to wear. The open toe design also means you can swim whilst wearing them and it does not disrupt the swim stroke. They are designed for use in swimming pools and as such are chlorine resistant, light weight, anti-bacterial and washable. Although they have a non grip sole it is not recommended to run anywhere in a swimming pool, just as you would not run wearing flip flops or other shoes at the pool. The girls said their swim shoes felt really soft. 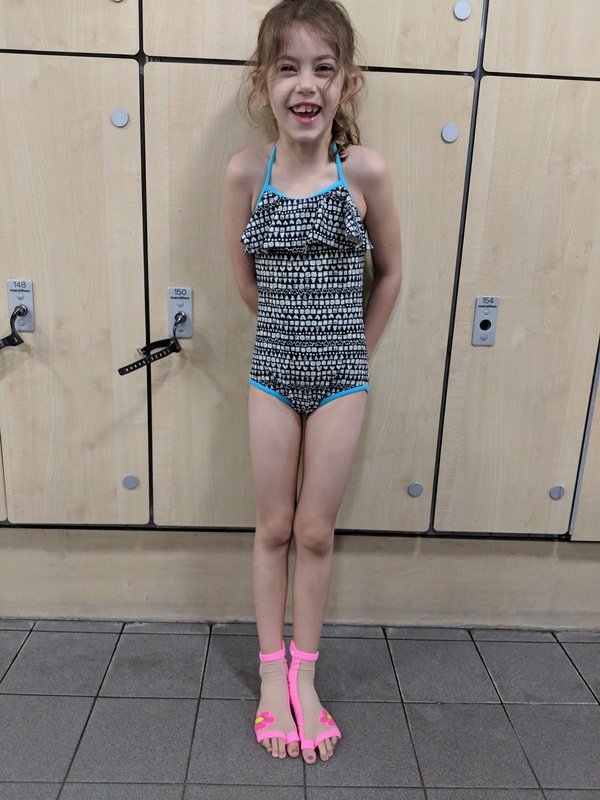 My youngest really liked them straight away, my eldest took some getting used to as she wasn't used to the toe piece but continued to do her lesson. 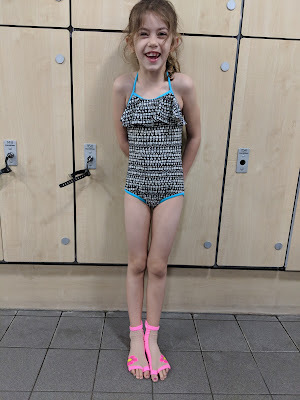 The Ockyz Sweakers had no impact on the girls lesson at all, and despite my eldest taking a little getting used to them something worked because she came out of her lesson with a badge! Both girls came out of their lessons with huge smiles and my eldest with a new badge! 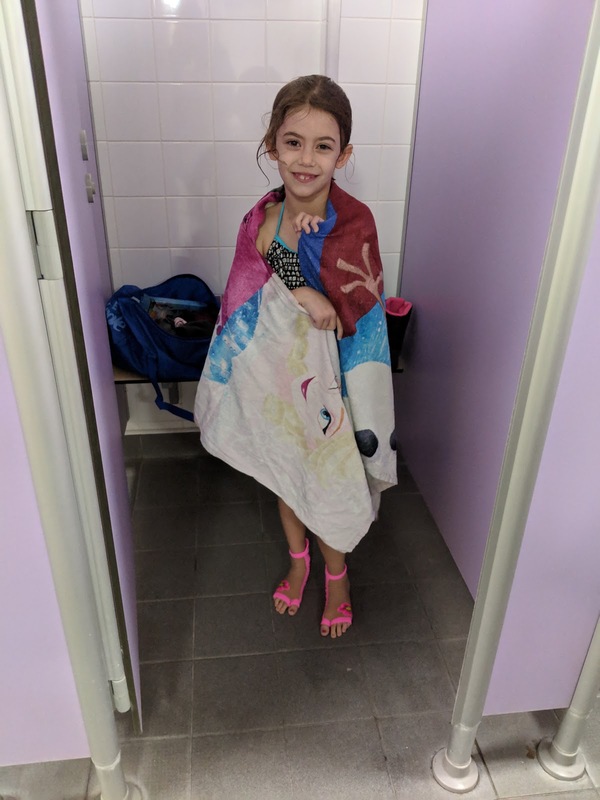 Safe to say that the Ockyz Sweakers are liked by both girls and we look forward to having lots more swimming pool fun! You can check out the range on Amazon also.